La-Z-Boy World Headquarters | JDRM Engineering, Inc.
"This building is designed for our future," said Kurt L. Darrow, Chairman, President, and CEO of La-Z-Boy. "It embraces our brand images and puts us in the 21st century." 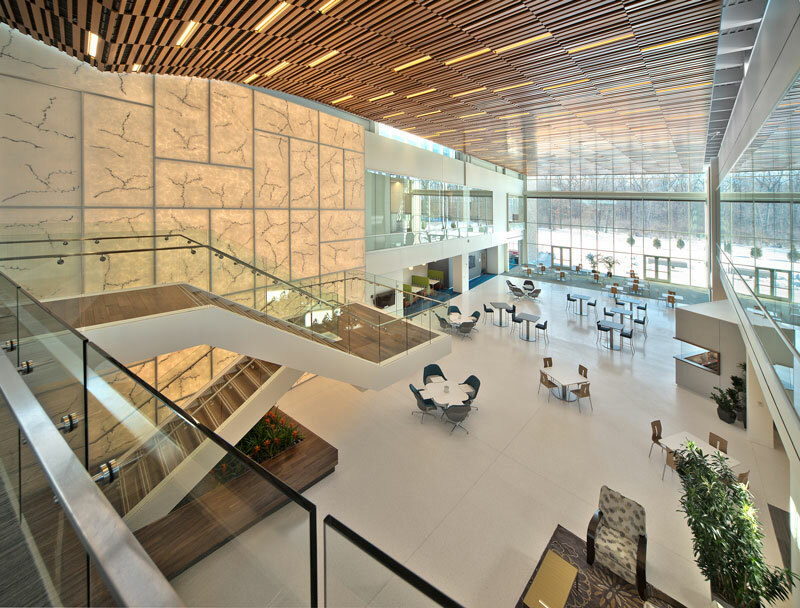 The 199,000 square foot, $62 million headquarters enhances collaboration through an open layout and features many amenities including a mini-store, full-service cafeteria, outdoor patios with chairs, and indoor lounge areas featuring La-Z-Boy products. To support the network of La-Z-Boy stores and distributors across the world, the facility includes a 24/7 Call Center and a 24/7 Corporate Data Center. 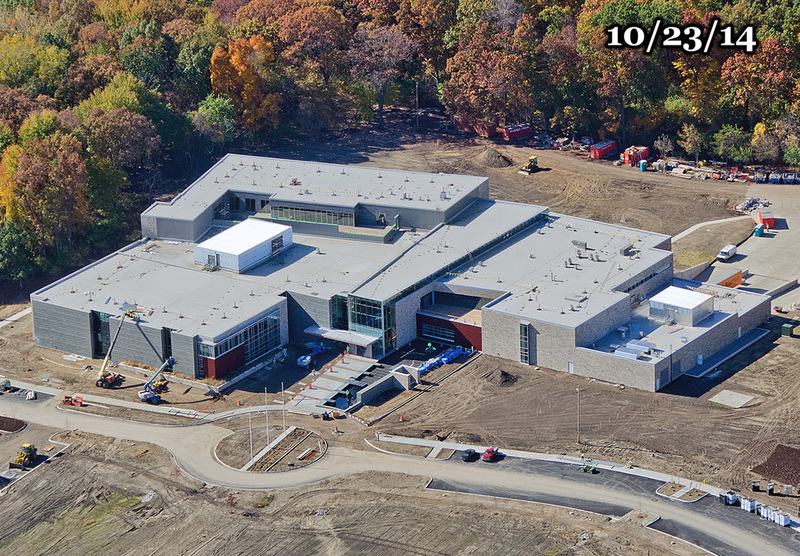 3D Modeling was used extensively in the design and construction of this sustainable facility which was celebrated upon its opening in mid-2015 and received LEED Silver certification August 3, 2015. Working closely with the architect and contractor, the building’s systems were engineered to reduce energy consumption and provide optimum conditions around the clock. The HVAC system incorporates a central geothermal system with standard vapor-compression style chiller/heaters designed for heat recovery operation. These units utilize a heat pump condenser water system that obtains and rejects heat to a closed loop geothermal well field. The well field consists of 252 wells that are 400 feet deep. The hot water system is generated by the central geothermal plant. The heating system is also supplemented with one 1,500 MBH input condensing boiler. The chilled water system is likewise generated by the central geothermal plant. Both the heating and chilled water distribution utilizes variable speed pumping. 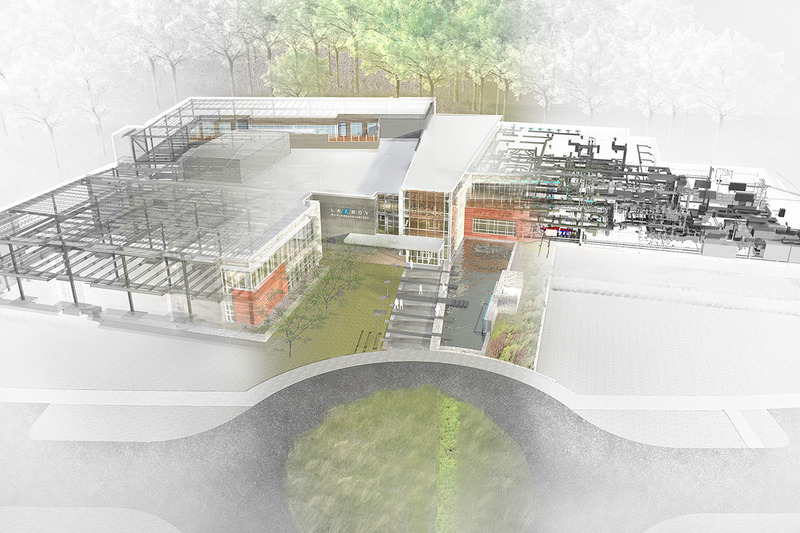 Air distribution to the building is provided by multiple air handling units. The units are a combination of constant volume underfloor air distribution units and overhead variable air volume units for perimeter zone control. The underfloor air is distributed at 63° F and the variable air volume boxes are supplied with 55° F air. All reheat is accomplished via the waste heat of the central geothermal plant. A micro-processor based building management system (BMS) employing direct digital controls (DDC) monitors, controls, and optimizes the operation of the HVAC systems in the building. Stand-alone DDC panels are networked together within the building and connected to a central operator workstation located in the building. The system also has an internet interface. The electrical service is a 13.2 kV primary voltage feeding interior electrical switchgear. Two (2) electrical unit substations serve the building with 277/480-volt, three-phase, four-wire configuration and two (2) electrical unit substations serve the building with 120/208-volt, three-phase, four-wire configuration. One electrical unit substation feeds the Data Center at 277/480-volt, three-phase, four-wire configuration. There are three (3) levels of surge protection devices located on the main distribution equipment, sub distribution equipment, and branch distribution equipment. The lighting, HVAC, and associated equipment are served from the 277/480V distribution system. The power utilization outlets and equipment are served from the 120/208V distribution. The isolation of the systems at the substation level is for an increased level of power quality. Motor isolation transformers are used for motors driven by variable frequency drives. Power factor correction capacitor banks included at the unit substations, provide adjustments to unity power factor. The capacitor banks are capable of automatic tracking and adjusting. Emergency/stand-by power is provided by a redundant set of on-site stand-by diesel generators. The generators include paralleling equipment to bring both on at start up. The entire emergency/stand-by systems will be able to be powered by one of the generators. The fire alarm system is an addressable type, with voice features, incorporating activation devices such as pull stations, smoke detectors, flow switches, duct detectors, etc. and audio visual devices such as speakers and strobes. An early warning detection system is utilized in the DataCenter. Mass notification audio and visual system is an addressable type incorporated with the fire alarm system. Exterior site lighting design involved Light Emitting Diode (LED) technology and is controlled by a microprocessor based programmable low voltage relay system to meet ASHRAE 90.1 Standards, utilizing programmed time control and photocell control. The open office areas utilize LED pendant mounted luminaires and are controlled by a microprocessor programmable low voltage relay system meeting ASHRAE 90.1 Standards utilizing programmed time control. Manual override controls located in the space override any programmed timed lighting control. Additional spaces throughout the building are designed with occupancy sensor controls and day-lighting controls. 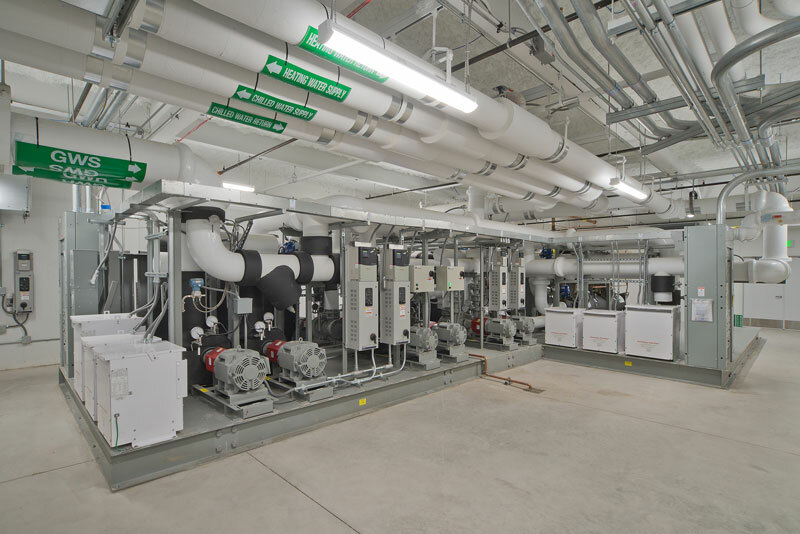 Data Center design includes a rotary machine type UPS system that does not utilize batteries and provides power for transfer from normal to stand-by generator power.